Floating display design for minimal face contact and maximum comfort enables users to play games or watch videos for hours in complete comfort. Built with comfort in mind, the iWear is a balanced, sleek and compact premium lightweight, wearable video headphone. And the headphone are collapsible and fold up for compact portability. Controls include on / off, EQ select, volume +/-, mic mute, 3D force, and brightness +/- for twin HD displays. The iWear supports HDMI inputs compatible with the latest 2D and 3D operating modes enabling the user to hook up to their mobile phones, tablet devices, console systems, PCs, and 3D Blu-ray players. Option to mount an Augmented Reality video camera add-on. Amazing audio with noise-isolation over ear design delivering crystal clear sound integrity with perfect pitch highs and a thundering base. 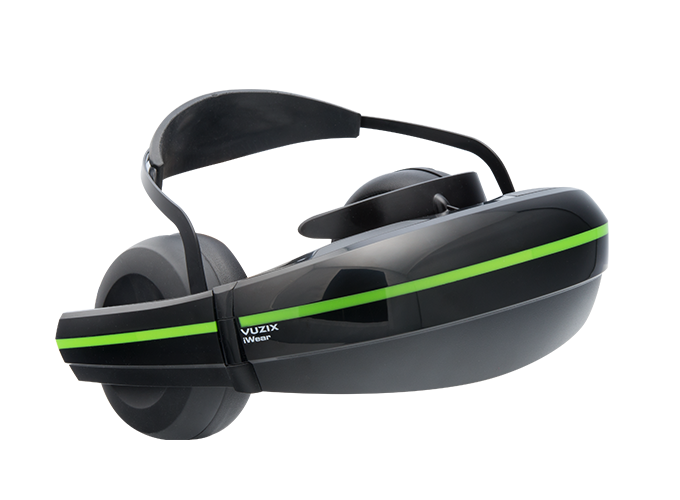 Includes noise-canceling microphones with mic mute for PC gaming. Built-in rechargeable lithium battery provides 3 hours of continuous mobile use for video and over 10 hours for audio only. An ultra-thin HDMI cable connection supports continuous playing. USB port enables battery charging, and connection to battery pack and continuous power (required > 1 amp for continuous use). Comes only in sleek black color with a green highlight stripe.